P22 is excited to have our new book Kickstarter funded. This book will be the first extensive monograph on Bruce Licher's Independent Project Press and Independent Project Records. It will be called: Savage Impressions—An Aesthetic Expedition Through the Archives of Bruce Licher and Independent Project Records & Press. With the current explosion of interest in letterpress, many are looking to see how new work can be influenced by the past. Active since 1982, Bruce Licher’s Independent Project Press is a contemporary studio that has bridged technological eras and produced an unparalleled body of work. It has culled from the past while simultaneously turning it on its head with a distinct visual vocabulary that continues to influence current aesthetics. For the first time, a comprehensive overview of Independent Project Press and Independent Project Records is being complied into a monograph published by P22 Type Foundry and P22 Analog. With Kickstarter crowd funding concluded, this book can be produced in a quantity and quality that displays the limited edition, hand-made work of IPP in over 200 pages of full color, from mechanical process work (for clients such as REM, Stereolab, and Camper Van Beethoven) to finished works of art with insights into the creative process along the way. The text will include exhibit catalog essays as well as material from Rudy Vanderlans’s Emigre magazine that featured the work of IPP. Co-designed by Bruce Licher and P22, the book will be a 12” x 12” hardcover book that displays in full color the diverse range of art and design produced by IPP. It will be produced in an edition of 1000 copies with 300 of thoese being a limited edition deluxe version that includes a 12” vinyl record. This book will be a profound reminder of the value of the hand-made and how it can interface with the mass produced. 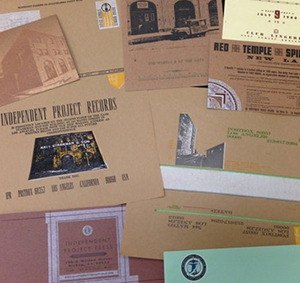 It will stand as a major documentation of one of the most influential letterpress studios currently in existence. The final retail price of the standard edition book will be $69.95 (Deluxe Edition $99.95)- but if you pre-order before the book is published, you can get it for $55 ($85). BRUCE LICHER is a musician, artist & designer who founded Independent Project Press after learning the art of letterpress printing at the Women's Graphic Center in downtown Los Angeles at the beginning of 1982. 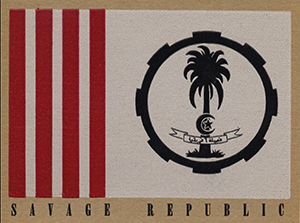 His initial projects centered around creating album covers, postcards and promotional stamps for his band Savage Republic. It didn't take long before he was producing work for other L.A. underground music groups, along with a growing number of clients in the Los Angeles design community. In addition to packaging and releasing music on his own record label (Independent Project Records), his other music-related clients . 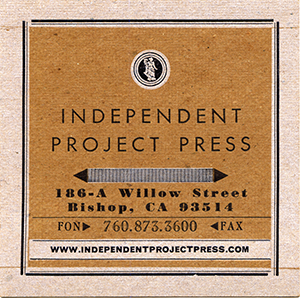 Independent Project Press also produces elegant and creative business stationery, invitations, wine labels, promotional stamp sheets and booklets, and numerous other pieces of letterpress-printed ephemera for clients large and small. Licher was nominated twice for a Grammy Award for his album packaging, and has been credited with starting the trend in letterpress-printed CD and record packaging using industrial-style chipboard. His graphic design and letterpress work has been featured in two major design exhibitions at the Cooper-Hewitt National Design Museum in New York City, and has also been exhibited in California, Arizona, and Paris, France. After 17 years living and working in Sedona, Arizona, Licher and his artist wife Karen have relocated Independent Project Press to the Eastern Sierra town of Bishop, California.